Preservatives are routinely added to food and drink products, as well as cosmetics and other toiletries, to extend their shelf-life, by preventing the growth of microorganisms. The presence of water is essential to the growth of microorganisms – therefore water-containing products that are not refrigerated (refrigeration slows the growth), heat-treated (effectively sterilising the product), or exposed to UV light or ionising irradiation (damages the DNA of bacteria, fungi and viruses, preventing reproduction) will need added preservative. Some products are considered ‘naturally preserving’, because either they contain no water, or are an inhospitable environment for the growth of microbes, including sugar, vinegar, salt, dried foods and pure oils such as olive oil. Mokosh 100% certified organic skin care products are naturally preserving since they are water-free, and do not require preservatives. The safety of preservatives is assessed by regulatory bodies, who set standards for both the type and concentrations of preservatives allowable in food and skin care products. The most talked-about preservative in recent years is the paraben group of preservatives, which appear on product labelling as methylparaben, ethylparaben, p-propylparaben, isobutylparaben, n-butylparaben and benzylparaben. Because of their effectiveness against both bacteria and fungi, together with their relatively low cost, they are widely used. Until recent years, they were also considered very safe, and are still considered so by regulatory authorities. Users of Mokosh would know that no preservatives are used in our products, because they are formulated without water. However, in addition to skin care, preservatives are used in virtually every toiletry product – toothpaste, shampoo, conditioner, deodorant, body sprays, sunscreens and many pharmaceutical products. Because parabens are by far the most widely used preservative, we’d like to fill you in on what we’ve found out about them. We hope you will be extra vigilant about reading the ingredients label when purchasing these products, and think twice about using them, especially on your children! Parabens have traditionally been termed ‘weak oestrogens’ because of the low level of oestrogenic effects demonstrated in tissue cultures and live rats in the laboratory – including reduced testosterone levels and abnormal sperm formation, and proliferative effects on the uterine glands. These oestrogenic effects have been considered unlikely to occur at the far lower concentrations of parabens used in cosmetics. These and other studies were the main basis on which claims of safety were made. However, although in these studies the oestrogenic effects of parabens could be seen only at far higher concentrations than used in commercial products, some scientists believe that stronger oestrogenic effects could be seen in the case of long term low level exposure (Darbre and Harvey, 2008). Indeed, little work has been done on the effect of chronic long term exposure to parabens – worryingly, this is how we use them. Parabens and their metabolites are absorbed readily through the skin (up to 80% absorption rate), metabolised by skin enzymes, enter the bloodstream and are then excreted, predominantly in the urine (for review see Myers et al, 2015). Recent studies show that, compared to parabens taken orally, metabolism by skin enzymes may be less efficient, allowing intact parabens to enter the bloodstream, and possibly other tissues. Because of this difference in efficiency of metabolism between the two routes of exposure, it has been suggested therefore, that intact parabens found in tissues and urine are more likely to have come from parabens applied to the skin, rather than by ingestion (Darbre and Harvey, 2008). This is significant because parabens occur naturally in some foods, including berries, carrots and onions. The presence of intact parabens in the bloodstream, albeit for relatively short periods before they are excreted, is of concern. It was recently shown that some forms of paraben when at peak blood levels had oestrogenic activity equivalent or greater to the endogenous levels of oestrogen found in pre-adolescent children. This means that parabens would significantly add to the oestrogenic load in children, with potential effects on reproductive organs (Boberg et al, 2009). In addition to their effect on the oestrogen receptor, parabens are now also thought to act by inhibiting an enzyme (a sulphotransferase) which inactivates oestrogen, thereby increasing the free level of oestrogens (Prusakiewicz et al, 2006). They have also been found to have anti-androgenic effects, reducing testosterone levels (Satoh et al, 2005). A study carried out in 2004 showed the presence of intact parabens in 18 of 20 human breast tumours (Darbre et al, 2004), indicating that parabens may not necessarily be excreted completely from all tissues. A more recent study by the same group (Barr et al, 2012) examining 40 breast cancer cases showed that all 40 contained parabens. The source of these intact parabens was not clear, however it was proposed that parabens present in products applied to the skin, particularly to the underarm area – deodorants, depilatory creams, and body sprays – could have been absorbed across the skin and accumulated in breast tissue. These studies do not establish any cause-effect relationship between parabens and breast cancer, or other hormonal effects on humans. However, the potential oestrogenic effect on children is particularly alarming, with possible severe long term implications. The lack of complete knowledge of the metabolism and retention of parabens and their metabolites following application to human skin, and the absence of studies looking into their long term persistence and bioactivity in the body, raise serious questions about their safety margin. It seems statements made by regulatory authorities regarding safety were based on studies that do not necessarily mimic real life usage. With respect to cosmetics, where products may be used daily, from baby-hood to old age, this is particularly worrying. Recent studies have shown that methylparaben, in the presence of sunlight, results in the production of molecules known to be associated with oxidative stress, resulting in damage to DNA and potentially accelerating skin ageing (Osamu Handa et al, 2006, Yoshinori Okamoto, 2008). Therefore, methylparaben-containing skin care products and sunscreens could have, on exposure to the sun, the effect of accelerating skin ageing and increasing the risk of skin cancers, the 2 effects they were designed to prevent! Make your own choice about using paraben-containing products, but remember there are still major question marks about their safety. We strongly recommend that you do not apply paraben-containing products to babies and children (and yes, there are plenty of these products out there! 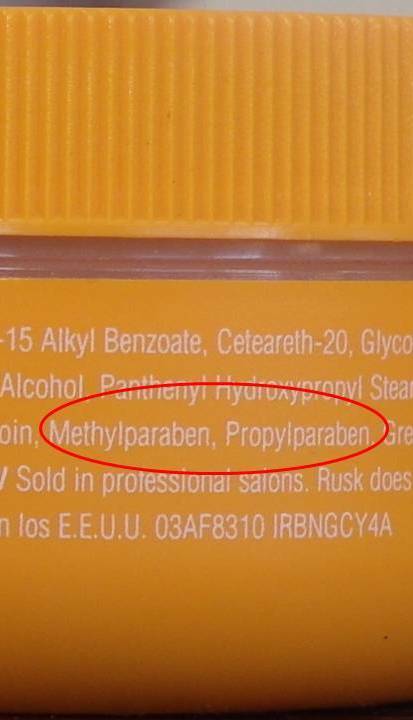 ), and make sure your sunscreen doesn’t contain methylparaben. Interestingly, a quick scan of the Cancer Council Sun Smart site suggests choosing a sunscreen with an SPF of 30+ - no suggestion to check the ingredient list! Myers, S.L. et al (2015). "Estrogenic and anti-estrogenic activity of off-the-shelf hair and skin care products." 25: 271-277.
species. Pharm Res 2006; 23(7):1517‐1524.